Stay up to date with everything that's happening at The Gathering Place! 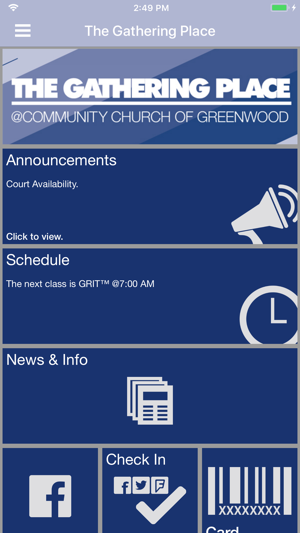 "The GP" is a sports outreach ministry of Community Church of Greenwood and is open to the public. Our 82,000 square foot indoor sports complex is located in Greenwood, Indiana, south of Indianapolis. It includes 3 basketball courts, an indoor soccer field, track, racquetball court, cardio machines, weight room, and group fitness rooms. Adult and youth leagues are available as well as group fitness classes. Use our app to stay up to date with league registrations and schedules, fitness class calendar, special events, announcements, and more!